...Niagara Falls. That's what we had going on yesterday. For as long as I can remember, I've wanted a garden with a water feature. When we put in the courtyard, I thought that finally the time had come. I drug the girls along on several fountain searches. I swear I saw every fountain in Kitsap County. I wanted something a little rustic, not too formal, but fairly large. On Thursday I was determined to find our fountain. We took a long drive out to "Fountain Paradise", as Rose called it and the girls tested each fountain. By testing, I mean they put their hands underneath, or in Cholita's case, occasionally her head. It was a hot day. Anyway, Rose was quite enamored of a fountain that featured a hobo huddled under an umbrella. It was....nice....but not quite what I was looking for. Despite the selection offered by Fountain Paradise, I still didn't find "the one". We stopped at one other place on the way home. They had a very formal three-tiered fountain, a few tiny bubblers, and one with frogs spitting onto lily pads. Needless to say, my girls fell in love with the spitting frogs. I was about to leave when the saleslady mentioned that they had one more out in the back. It was large and fairly traditional, but made with more rustic materials. I saw it, called Lyle who was just finishing up at work, he arrived at the nursery, said he loved it, and we loaded it into the truck while the girls weeped and said good-bye to the frogs. After much debate over the placement of the fountain (it was going into a circle---duh, put it in the center), we placed it off to the left. Lyle wanted it centered and I had the odd design inspiration that it should be off-center. Lyle said, "If Mama ain't happy, ain't nobody happy" and against his better judgement, leveled the ground and assembled the fountain. We stood back to have a look and I immediately thought, It should be in the center. Lyle is so very long suffering and he didn't even say I told you so, like I would have done. So we moved the fountain--no small task, and then we filled it with water, plugged it in, and......."Wow! That's loud." "What was did you say?" "I said, WOW! THAT'S LOUD!" Lyle yelled, "It makes me feel nervous. Like someone left the bathtub running." Bruder offered, "I feel like I have to go to the bathroom." Rose pouted and loudly said, "The guy under the umbrella was quiet!" Cholita put her hands over her ears. "I liked the frogs!" Lucy said, "Our garden lacks whimsy. The umbrella guy and the frogs would have given us whimsy..."
She seriously used the word "whimsy". So, I could hardly sleep that night knowing I'd created a loud, whimsy-less garden. 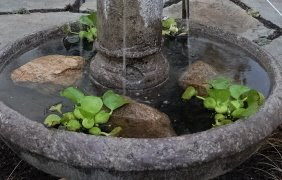 But the next day we added rocks and some water hyacinths and Niagara Falls was mercifully toned down to a gentle trickle. And we planted some lovely hucherras with names like Licorice, Marmalade, and this little one--Ginger Ale. Plants with names like that have to supply some whimsy, don't you think? And now I have my fountain garden. And I love it. I love the backdrop of the blue-green leaves of the weeping katsura tree. And I love how we can see it from the front garden, but can only hear it when we get a little closer--instead of at our neighbors yard a few acres away. Our whole family seems to like it. Lucy said it looks rather whimsical and even Rose deemed it acceptable. But she's found another spot in our yard that she claims is just begging for a fountain. She's thinking something along the lines of.....hobo. Eileen will you come and landscape my yard. It is over-grown and confusing to me. I will pay you handsomely in chocolate chip cookies and delightful conversation! Oh I love it Eileen! !